4 Bedroom Detached House For Sale in Northallerton for Guide Price £350,000. Historically the village Police House, this detached three / four bedroom family home has and abundance of character features throughout from original coving to feature fireplaces. 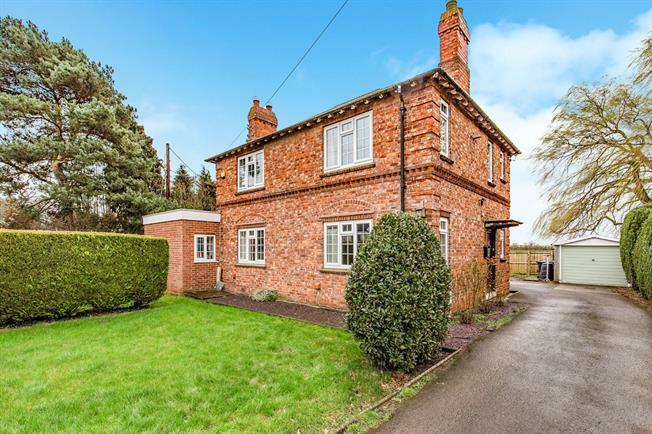 The property is on a generous corner plot with wrap around gardens and off street parking with outhouses and a detached garage. Viewing is highly recommended to fully appreciate the character and space that this home has to offer. Feature fireplace, original coving, wooden flooring, uPVC window, radiator. Dual aspect uPVC windows, feature fireplace, carpeted flooring, radiator, original coving. The office has the potential to be a fourth bedroom, the room has multiple aspect windows, with French doors leading to the decking area and rear garden, laminated flooring, and radiator. Modern fitted kitchen with granite work tops, one and a half bowl sink with drainer, tiled flooring, uPVC double glazed window and door leading to the rear garden. Located off the kitchen the utility room has tiled flooring, and pluming for a washing machine. Ground floor W.C. Comprising, a standard W.C. And hand wash basin. Multiple aspect uPVC double glazed windows, carpeted flooring and in built storage cupboard. Fully carpeted with uPVCdouble glazed window and radiator. Fully carpeted with uPVC double glazed window, and radiator. Separate first floor W.C., comprising a standard flush W.C. The family bathroom comprises a panelled bathtub with shower over, and a pedestal sink, tiled flooring and walls, with extractor fan and towel rail.